Welcome to the day after tomorrow. In Gary Shteyngart's near-future New York, the dollar has been pegged to the yuan, the American Restoration Authority is on high security alert, and Lenny Abramov, the middle-aged possessor of a decent credit score but an absurdly low--and embarrassingly public--Male Hotness rating, is in love with the young Eunice Park. Like many of the clients of his employer, the Post-Human Services division of the Staatling-Wapachung Corporation, he'd also like to live forever, but all he really wants is to love Eunice. And for a time, despite the traditional challenges of their gaps in age and ethnicity and the more modern hurdle of an oppressively networked culture that makes your most private identity as transparent as the Onionskin jeans that are all the rage, he does. Yup, it’s another dystopian novel reviewed by Natanya! (Keep an eye out for my soon-to-come musings on the dystopian genre in general.) 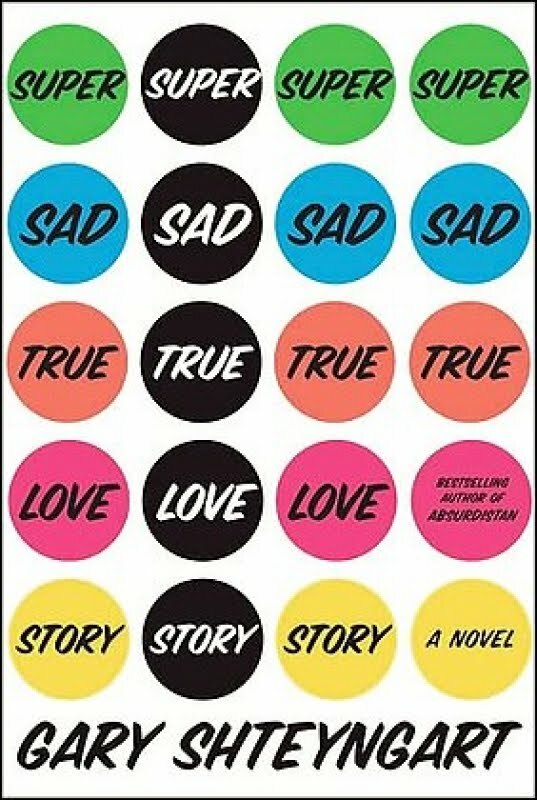 Like with The Maze Runner, I found the dystopian world in Super Sad True Love Story very interesting. In Shteyngart’s future, every economic, consumerist, and social media problem (or maybe they aren’t problems) we currently are facing in the United States is exaggerated, to the point where people, like Eunice Park, live to shop, and where socialization isn’t for the sake of being social, rather for popularity and hits on video streams. Essentially, it’s like the popularity struggles of high school completely melded with youtube and twitter. More significantly, it’s a world that is terrifyingly and disgustingly plausible, easily evolved from our current society filled with people tweeting what they ate for lunch. In Shteyngart’s New York City, everything is either about appearance or politics, creating a truly aggravating, but compelling, society. However, beyond that, most of my time spent reading this book consisted of either sheer boredom or aggravation with the nearly insufferable characters. Lenny is a complete moron who doesn’t really understand at all the society in which he lives. Consequently, he lives in his own bubble where the only thing that matters is loving Eunice, whose lifestyle and personality do not in the least mesh well with his own. I did enjoy getting to read the novel from the perspectives of both Lenny and Eunice (though mostly Lenny) through Lenny’s diary entries and Eunice’s emails, but on the whole, the plot moves really slowly, perhaps because of this narrative method. While reading, it is difficult to point out anything really wrong with the book (though Shteyngart’s writing is generally mediocre), but when I stopped reading I realized that not much had happened, and that I could barely even remember what had happened. When I was halfway through the novel, I had no idea where it could possibly be going, and only vowed to plow through it to see whether it got better near the end, and because I liked learning new bits about this dystopian society. It did, in fact, get a little better toward the end, when I finally hit the climax of the novel, but following the climax it went back to being totally bland. But then, at the very very end, I finally came to the conclusion that everything that bothered me about it was put in on purpose. It was clear that it was a satire, but until this point I was unaware of the extent of this satire. Consequently, despite having spent the majority of the novel considering it a complete waste of time and wishing I hadn’t ever started it, after finishing the final page I was torn. On the one hand, I think it deserves a low rating because, even though it redeemed itself at the end, the rest of it was barely tolerable. But on the other hand, my revelation at the end made me accept and appreciate the rest a bit more. So, frankly, I have no idea what to rate this. But in general, I probably would not recommend Super Sad True Love Story unless you go into it really holding the mindset that everything is on purpose and is supposed to be, to some degree, funny. As for me, I probably shouldn’t have read it. 2 stars? 2.5 stars? 3 stars? Very nice review - like you, the highlight for me was the nature of the dystopia. But after that, the characters that inhabit it and the plot that is supposed to be interesting just aren't. There's nothing very original here! Interesting! I was curious about this book, I believe I read an excerpt somewhere (in the New Yorker?) and couldn't decide if I liked it or not. I just read Russian Debutante's Handbook and felt much the same way. I'm a little sad that I don't like this author. I thought I would. I bought this as soon as it hit the shelves and immediately regretted the decision. I actually sold it shortly thereafter. I got what was he was trying to do, you know, social commentary embedded in caustic prose, but it was excessive. And if I had to read one more vulgar "intimate" scene, I felt I was going to chunk the book immediately. I found, like you, the characters were quite boring. Perhaps Shteyngart really wanted to emphasize the fact that our culture is becoming increasingly desensitized, and, perhaps, mindless considering the way he constructed these characters that rarely reacted to any type of invasion of privacy, or even the in-your-face advertising they were surrounded by... a world to come? Obviously, dystopian, but perhaps a little more realistic than many other forms of literature dealing with the great "what if." I probably won't even try to read any of his other titles, as I've heard similar reviews about his other work.